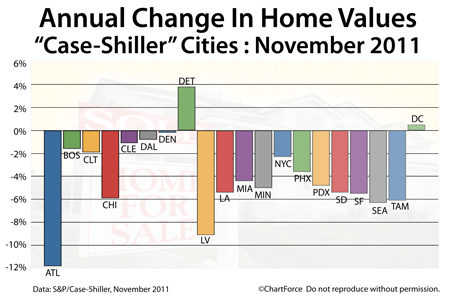 Standard & Poors released its November 2011 Case-Shiller Index this week. The index measures the change in home prices from month-to-month, and year-to-year, in select U.S. cities. According to the data, for the second straight month, home values fell in 19 of the Case-Shiller Index's 20 tracked markets. In addition, also for the second straight month, Phoenix, Arizona was the lone Case-Shiller-tracked city in which home values rose. Overall, November's Case-Shiller Index showed a 1 percent decrease in home values between October and November 2011, and a near-4 percent decrease between November 2010 and 2011, putting home values at roughly the same levels as 8 years ago. Don't read too far into it, however. The Case-Shiller Index, though widely-cited, remains widely-flawed. As a buyer or seller in Bethesda, for example, , relying on the Case-Shiller Index for market research can lead you to improper conclusions. To understand the Case Shiller Index's methodology is to understand why. First, the Case-Shiller Index draws its data from a very limited geography. There are more than 3,100 municipalities nationwide. The Case-Shiller Index tracks just 20 of them. And they're not the 20 largest, either. Four of the Top 10 Most Populous U.S. Cities are excluded (Houston, Philadelphia, San Antonio, San Jose) whereas Minneapolis and Tampa are not. Minneapolis is the 48th largest city in the United States. Tampa is #55. Next, when Case-Shiller Index gathers its data from its 20 cities, it only includes the home sale data of single-family, detached homes. This means that sales of condominiums and multi-unit homes are specifically excluded from the index. There are some cities -- Chicago and New York, for example -- where condominium sales represent a large percentage of the overall market. The Case-Shiller Index ignores that. And, lastly, when the Case-Shiller Index is published, it's published on a 60-day delay. Its data is not "current", therefore, and does little to tell buyers and sellers of Rockville and the country what's happening in their home markets right this minute. Instead, the Case-Shiller Index tells us how the housing market looked two months ago. If you're active in the real estate market, either as a buyer or a seller, the Case-Shiller Index does you little good. For real-time data that actionable, speak to a real estate professional instead. It's where you'll find your best, most reliable and relevant information.